The newly launched 2-wheeled intelligent scooter Airwheel S3 has just made an impressive debut in the Netherlands recently. As Harry Potter can ride his broom freely, one can steer the scooter easily and smoothly. Municipal construction department is also excited by the anticipation of this handy, easy-to-control transporter, which might reduce the pollution caused by cars. The 2-wheeled scooter Airwheel electric unicycle is a masterpiece with an optimized power system, a sensor module and tires. 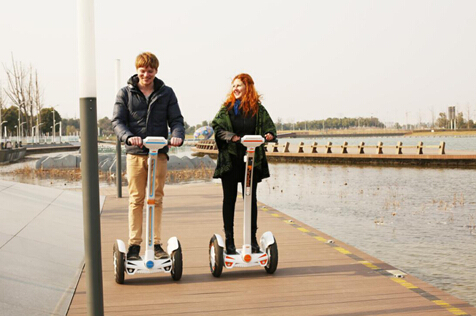 Powered by rechargeable Li-ion batteries, it can travel noiselessly without any emission. Its killer features are the complex micro-gyroscope and intelligent system which simulates body balance as the coordination of inner ear structure and central nervous system. 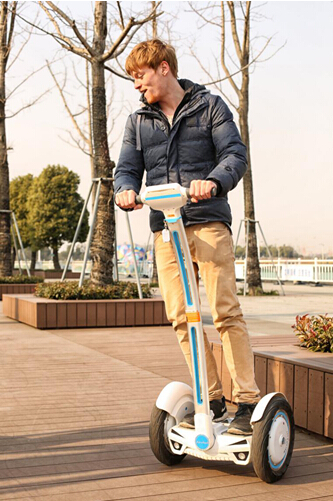 In addition, the sensor works as human eyes and skin to transfer the data of external changes to its intelligent system, so that the 2-wheeled scooter S3 keeps stabilized in riding. A rider controls the 2-wheeled scooter by leaning his/her body forward and backward, and twists the body to make turns. The Airwheel S3 sees global prevalence among young people as well as extensive application in some formal conferences.